Minor compatibility improvements and fixes. Added a feature to change the order of sheets (right click on sheet tab). Some very minor performance and functional improvements were added. A new type of curved path, a simple arc, has been added. When copying node styles within the styles screen, the original node style connection points and text margins were not copied to the new style. When changing a node's style (using the properties screen), the node's text margins were not being updated properly. Fixes a bug in which changing a node's style reset the internal node margin rather than using the margin of the style (if bound) or keeping the current margin (if unbound). Text Fields Simple text fields can now be added to node or label text. A text field is a string of text that reflects information about the diagram. Fields available in this version include file name, creation time, and last save time. Multiple formats are supported for each. Fields can be inserted into text by placing the text caret and choosing Insert Field from the main Edit menu or from the right click menu. Text Edit Undo/Redo In earlier versions, node and label text edits could only be undone in whole, reverting to the full text prior to any editing. Now individual text edits can be undone one at a time as is customary in word processing applications. While editing text in text mode, Undo is available from the Edit menu, from the right click context menu, or by the Ctrl-Z shortcut key sequence. Redo is also available in text mode as well (menu or Ctrl-Y). Note that Redo is currently only available for text editing while in text mode - it's not yet supported throughout the program. Holding down the Alt key while doing a lasso selection in Normal view selects objects on all layers. Interactive margins adjustment: Page margins can now be adjusted with the mouse in addition to using the Page Setup screen. Page Set-up: A new page set-up model allows setting of pages with any dimensions regardless of printers available on your computer. Page sizes that are larger than the selected printer can handle are automatically divided into multiple pages similar to poster mode. This feature makes diagrams more portable from one computer to another on which different printer drivers are installed. In addition, page defaults can now be saved and applied to new diagrams avoiding the need to set up the page for each new diagram. Internal Text Margins: The margins between the text and the edge of a figure can now be set individually for any figure. Tabs Figure text can now include tabs, and individual figures can be configured with custom tab stops including left, center, and right justified tab positions. Space Evenly now includes singleton free paths (those not attached to other objects at either end). Align now includes singleton free paths and path labels. Paths that intersect a node label now terminate there rather than overlapping the label. Added improved shadows and shading. Each diagram has shadow properties that can be set from the Diagram Properties screen in the Shadows tab. These shadows appear for any node that has the Drop Shadow property set. The Drop Shadow property is a checkbox in Node Properties / Node Styles screen in the General tab. There is also a new toolbar button to toggle drop shadows for selected nodes. Added gradient fills. Nodes can be filled with color gradients that blend from one color to another within the symbol. This provides a smoother and more professional appearance to diagrams. A new Fill tab in the Node Properties and Node Styles screens provides access to this feature. Adds greater variety of partitions to templates and symbol gallery. UML 2.0 diagramming support. Includes new diagramming notation for component/deployment diagrams, activity diagrams, class/object diagrams, sequence diagrams, package diagrams, use case diagrams, state diagrams, plus the new communication diagrams, composite structure diagrams, and interaction overview diagrams. Key enhancements include, frames, ports, artifacts, provided and required interfaces, new active object notation, new component notation, new subactivity notation (subdiagram rakes), time signal, flow finals, interface assemblies, and a very large number of new automated behaviors to help you create UML 2.0 diagrams efficiently. New Snip Path feature. Paths can now be easily cut in half at any point. Curve Improvements. Curved paths are more powerful. They now fully support path labels (without distortion) and jogs. In prior versions, labels placed on curves could cause the curve to distort where it met the label. Activations, forks, and joins path handling is improved. The way that paths work in concert with these symbols is easier and more reliable. Capabilities for editing and maintaining paths have been improved. You can now reposition path ends with greater flexibility including attaching to other paths. In addition, junctions required to attach paths to one another are now eliminated automatically when appropriate, keeping diagrams cleaner and easier to manage. Plus, you now have the ability to 'merge' two paths by dragging their ends together. Boundagon improvements. When you import a graphic image or clip-art file, the contours of the symbol are traced to determine its approximate outline shape which is then used to draw it properly and attach paths. This outline is nicknamed a 'boundagon' and its calculation has been improved to better reflect unusual shapes. Path segments can now be selected and detached from (dragged off of) a junction of three or more segment by selecting only the one and dragging it. We now allow a path endpoint to be dropped onto another path and attached, making moving the endpoint just as powerful as creating the path. The cursor changes to include a small "+" sign when over a node or path to which the end will become attached. Junctions created automatically (when a path is dragged to attach to another) are now automatically removed when the path segment is no longer attached, provided that the removal of the junction has no effect on the path. Bug fix: When connecting a path from a point on a path to another point on the same path, undo caused a crash. Bug fix: Sliding of paths attached to sliding connection point on activations, forks, and joins did not adjust properly when sharing a connection point, or when a number were selected simultaneously and moved together. Improved network support. Open diagram files are locked until closed to prevent two users from making simultaneous changes resulting in one being lost. When the second attempts to open a file already in use, they will receive a message and an option to open the file read-only. Bug fix: When dragging a path end off of an activation, it was too easy to accidentally attach to a label, so we now enforce that the endpoint only attach to another activation symbol. Bug fix: When moving the endpoint of a path with a label off of a node, undo caused the label to be inadvertently detached from the path. Bug fix: Undo of connection point repositioning caused paths to become confused and move to random locations. Bug fix: Connection points that were shared by multiple attached paths were not adjusted properly when only some of them were moved independent of the others. Bug fix: Cyclic paths (those that leave a node and re-enter) were being fully removed in all cases when they were deleted. Bug fix: Undo of a Remove From Flow feature was not restoring the draw order of the node. Bug fix: When a path attached to a sliding connection point such as on an activation, and the other end was free, sliding the path did not properly adjust the free end. Bug fix: When dragging a node that is located within a flow (has two or more attached paths), the node was permitted to be dropped into another flow when it should have been prevented. Bug fix: When you added a connection point in connection point mode by right clicking on a node, the connection point was not snapped to the proper position. Bug fix: Grouping would sometimes include only portions of a path. Now the entire path (including all labels, and junctions) are included or excluded in a group together. They are included automatically if objects on both ends are included in the group, and are excluded if either end has an object not included in the group. Added fully customizable toolbars and style bar. You can now determine which features are available on all toolbars and how they are arranged. Plus the style bar (sidebar for symbol selection on the left of the screen) is now fully customizable for any diagram or template using a simple new standardized user interface. Introduced are updates to the .EDG file format required for future enhancements. These should not affect you in any visible way. However, if you attempt to open a diagram saved by this version using an earlier version, you will receive warnings (which can be safely ignored). Working with Activations in sequence diagrams has been greatly improved by the added capability to drag messages along the activation (individually or in selections of multiple messages), making it much easier to make room for additions along the activation. Forks and joins have been improved similarly. This is a simple update that adds the interface symbol to the UML Class Diagram template at the request of a customer. New option to control whether paths are deleted automatically when an attached node is deleted. This is the first version of this product. We have chosen to keep the version number consistent with our family of products which are all based on the same customer-proven diagramming engine. 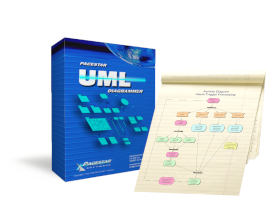 Consider this release the "1.0" of the UML portions. Templates: Activity, Use Case, Sequence, State, Class, Collaboration, Package, Component, Deployment, and hybrid UML diagrams. New diagram wizard for selecting special sizes and color schemes for all of above.